It’s official, the LG G7 will look like the above top notch toting smartphone and will actually be called LG G7 ThinQ. The render image above, which was leaked by AnrdroidHeadlines, does look a lot like a previous leaked image claiming to be the G7, which we reported here. Presuming this is the official render of the LG G7 ThinQ, then it looks like we’re in for a nice wide selection of colour options from the outset. 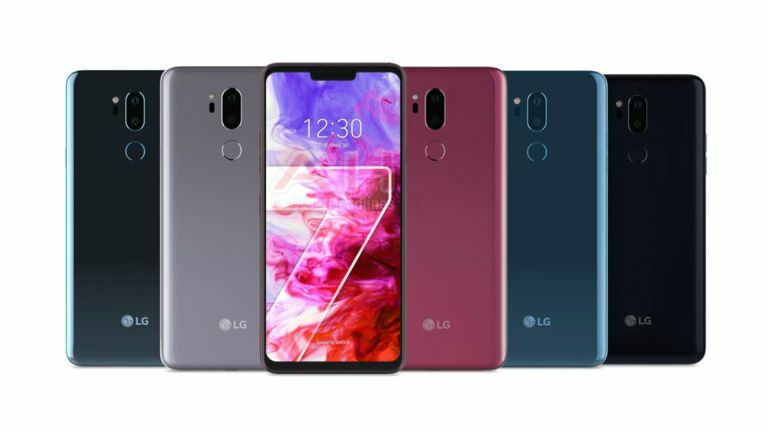 The G7 will come in five colour variants which are called “Aurora Black”, “Platinum Grey”, “Moroccan Blue”, “Moroccan Blue (Matte)” and “Raspberry Rose”. Who comes up with these names? The black will be the standard colour option on the G7 ThinQ. The big reveal from this image is that the G7 will indeed come toting a top notch, a la iPhone X – it appears to be all the rage these days. That does mean a near bezel free, edge to edge display. Also like the competition, in the Samsung Galaxy S9 Plus, the LG G7 appears to sport a dual rear camera setup. There should also be a fingerprint reader here on the rear by the vertically aligned camera lenses. The G7 ThinQ also features a button solely for quick activation of the AI assistant – which shows why ThinQ, LG’s AI name, made it into the name of the G7. Expect to hear more soon as the LG G7 ThinQ is rumoured to get launched in April or May.